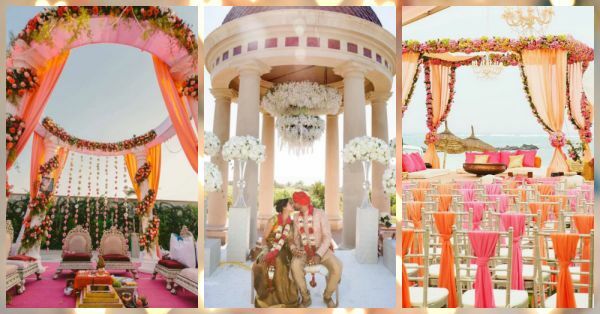 21 Wedding Mandap Designs That Are Perfect For Your Special Day! There’s just something about weddings that makes everything so much more special. Families coming together celebrating love and the union of two people who want to spend all of eternity together. It’s your special day and for that one moment everything must be perfect. Your bridal outfit must shine, your groom should be looking dapper and be completely besotted by you and the whole environment must be fun-filled. The colour in the theme of the wedding is very important. Shades on the same palette look stunning, compliment each other and blend together in a seamless way. The shaadi photographs come out stunning when there’s a singular hue or a couple of tones in the wedding decor. Many things need to be kept in mind when selecting a colour theme- the setting of the ceremony, the time of the ceremony, the bride and groom’s ensembles etc. 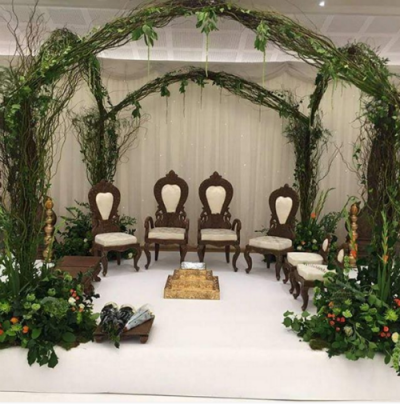 The setting can help, for instance if you’re planning to get married in a green patch of land, then a more earthy and rustic vibe would look great. If you’re planning to get married in the day, pastel shades will look better because they won’t be as jarring to the eyes as a traditional red. And for night time weddings, bright reds, oranges, golds can be chosen for them to outshine against the dark backdrop of the night sky. If you’re very sure of what you and your hubby-to-be are planning on wearing, then it would be great to keep in mind the outfits when deciding colour theme for the mandap. Afterall, you want everything to looking coherent and not displeasing to the eye. 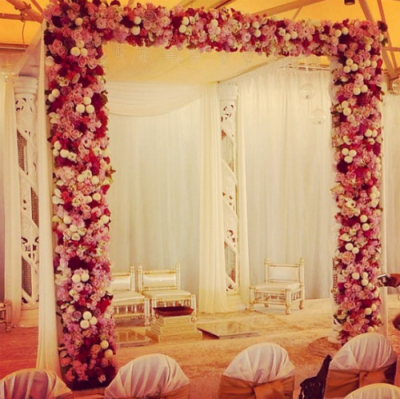 Drapes and flowers are the main ways to decorate a wedding mandap. Most people actually use a combination of both when designing their shaadi decor. For flowers both international as well as Indian are readily available in the market these days. Traditionally the most popular ones are carnations, roses, jasmine, tuberose (rajnigandha), gerberas, and marigold. 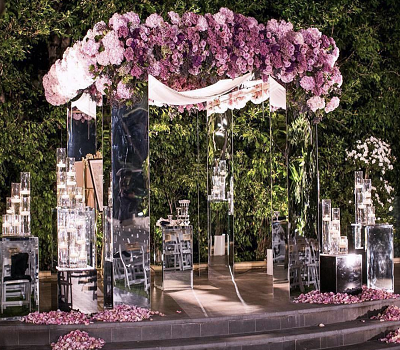 These not only beautify the wedding decor but also add a certain charm and fragrance to the place bringing everyone closer to the enchanting and mesmerising ways of nature. 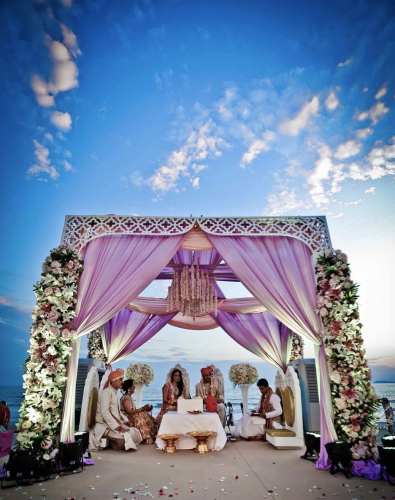 Traditional mandap designs are the ones which in keep with the way these structures have always been designed. 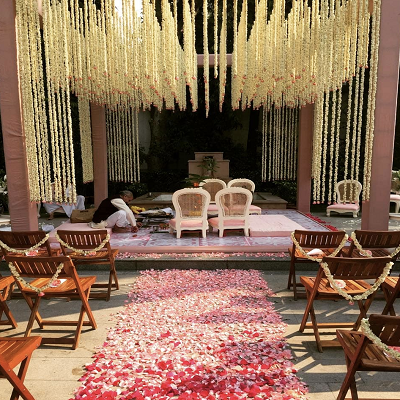 Traditionally drapes of bright and festive colours are used, flowers like marigold, jasmine, mogra and roses are used to adorn the pillars. All this is done when the ceremony is also in theme of the vedic traditions. 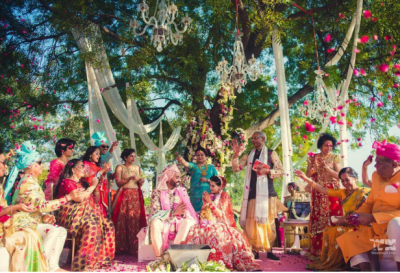 You can consider having a traditional mandap if your bridal ensemble also is the customary red. 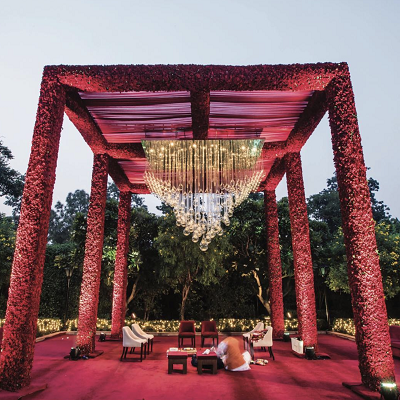 Deep scarlets, maroons and bright rubies look stunning against the backdrop of this decor. If you want to have a contrast, golds and yellows are a great option and they’ll make you shine brighter on your special day as well. 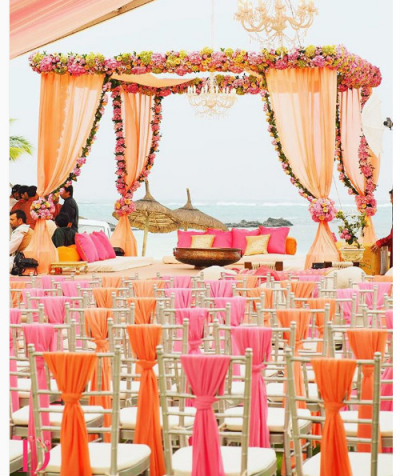 You can even go for a mixed coral palette if you want the ritualistic canopy but with a twist of a modern day look. Today’s weddings are all about contemporary designs. 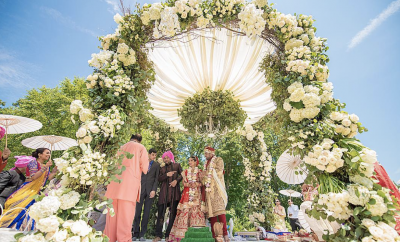 There are elements being picked up from the west and incorporated in desi ceremonies and the this is having an effect on everything from outfit to decor. 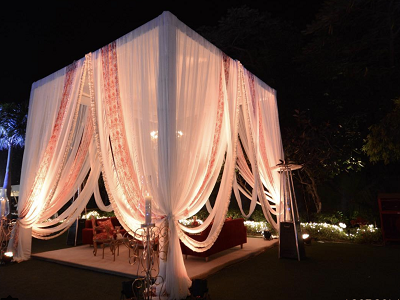 The new-age mandap designs are quirky and add elements of fun to the long-established structure. Some people add opulent mirrors to get a chic, bold and statement look. Along with this shades of burgundy and deep plums act as a great contrast. Another very popular theme these days is a whimsical bohemian wedding. So why should the mandap not be in line with it. Add airy whites, twigs, leaves and flowers too achieve this perfectly. 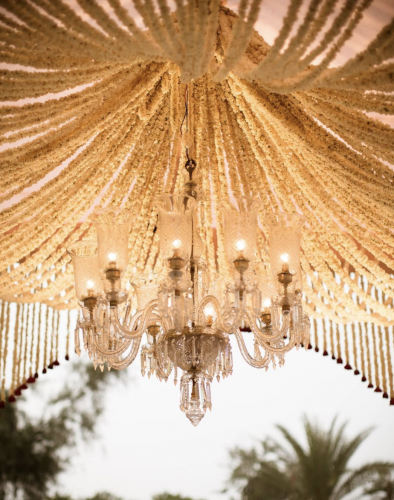 Chandeliers and twinkling fairy lights are also great for a night time function. They decorate and look great while also lighting up the entire place. Also what’s more romantic than getting married under the thousands of stars and lights blessing you both?! 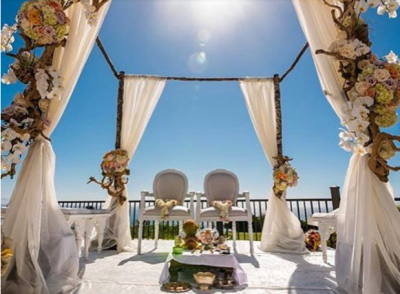 If you’re choosing a picturesque location for your wedding, it just makes sense to use it as a part of the wedding decor. 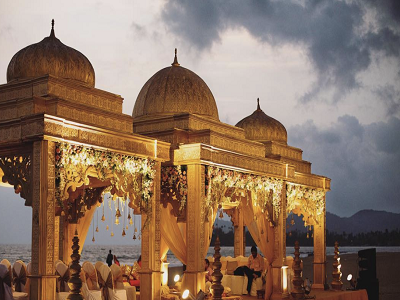 Your ceremony will be one to remember if you have it by the lake in Udaipur or on the sandy beaches in Goa as the sun sets. You can even choose a destination in the middle of the forest or overlooking the mountains. This way you won’t have to spend too much on beautifying the place as it’ll already be gorgeous. 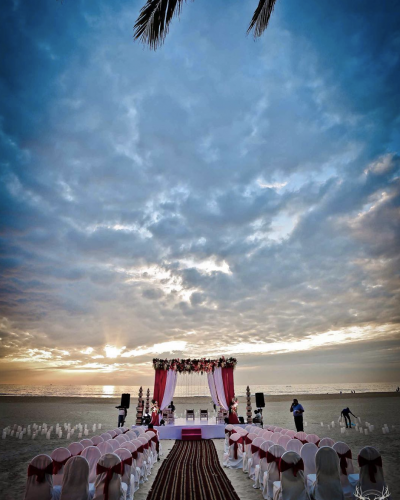 For a beach wedding, pick out pastel hues or light corals so that it meshes well with the endless blue waters, sandy shores and the sunset shades. 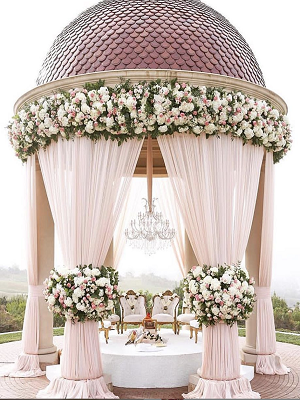 If you are getting married with a theme of royalty and embodying all things regal, then getting structures with domes and those with a Mughal feel would suit well. If you’re going fully rustic theme then adding natural elements of greens will be a great option. 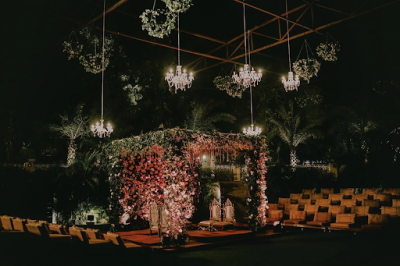 Another one you can consider is not having a structural mandap at all and use the trees as natural canaponies. Image Source: Instagram With the wedding season around and the many themes of decorations available, it becomes a little chaotic to choose. But we hope these ideas and designs have helped you out in deciding. We’ve got a whole lot of wedding themed content here, so stay tuned for all the latest on the shaadi front. 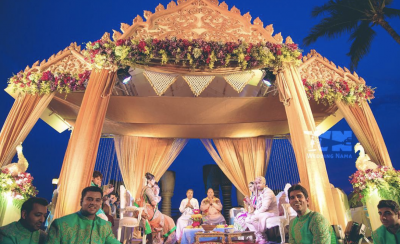 What Is The Wedding Mandap Ceremony? Mandaps during an Indian wedding are of the utmost significance as the most sacred and significant rituals are performed here. In keeping with your rituals and traditions, the entire wedding is organized. Of course it differs from place to place depending upon where you come from but the basic notions stay the same. 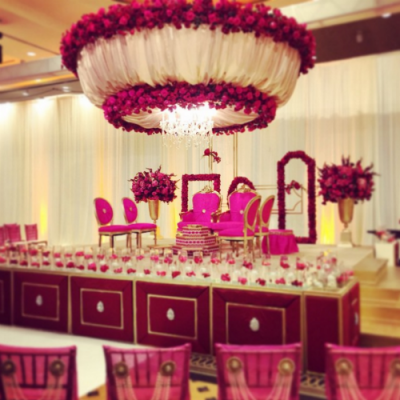 Shaadis here are a grand affair and every ceremony holds importance. 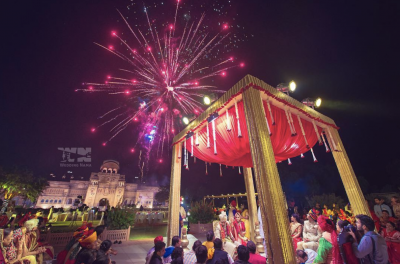 The pre-wedding functions like sangeet and mehendi are crucial in their own way but the mandap ceremonies are more important than them all. After the varmala, where the bride and groom make each other wear garlands, the couple is blessed by all their near and dear ones. 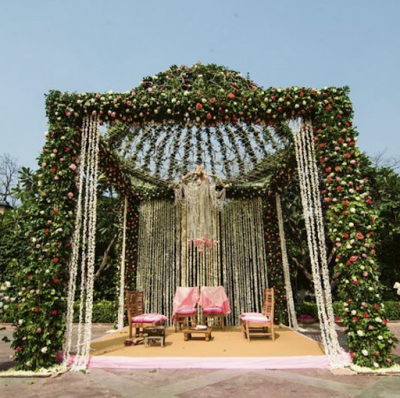 This is followed by the mandap ceremony which is performed under a canopy supported on four pillars. This structure is called the mandap and traditionally it was supposed to be made of bamboos and decorated in bright colours of reds and oranges. However, these days it is designed in-keeping the general theme of the wedding. 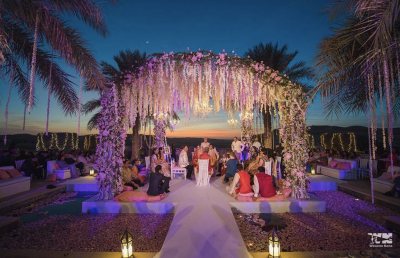 The four pillars symbolise both the bride and groom’s parents who are always looking after their children and showering them with love and happiness for the future. 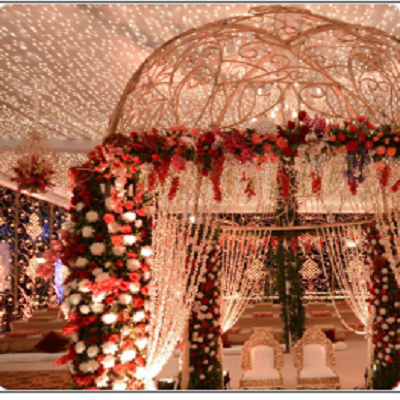 This usually takes place at the bride’s house, but in recent times, it is constructed at the wedding venue itself. The rituals are performed by a priest as the couple sits in front of a sacred fire, chanting hymns and prayers. The main ones are the saat phere where the two promise to be each other’s in this life and all the six lives to come. 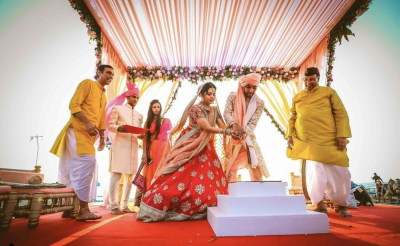 The kanyadaan is also performed where the girl’s parents officially give her away to the groom and the maang bharai also takes place where the dulha fills his beloved’s parting with sacred red sindoor so as to make her his forever. 1 . The four pillars symbolise the four stages of life in accordance with the vedas. The Brahmacharya, grihastha, vanaprastha and sanyasa. It is supposed to be under this canopy that the man steps from the brahmacharya phase to the grihastha or householder. The pillars also signify the four parts that a human life is comprises of- dharma, artha, kama and moksha. 2. The pillars signify the couple’s parents and the walls of their new home as a happily married couple. 3. Another inference of a mandap is also that symbolises in a sense the entire universe. All four of the pillars symbolise one element of the world- Earth, fire, air, and water. And the fifth element- space is represented by the canopy on top. 4.Indians weddings are a colourful affair, no doubt. 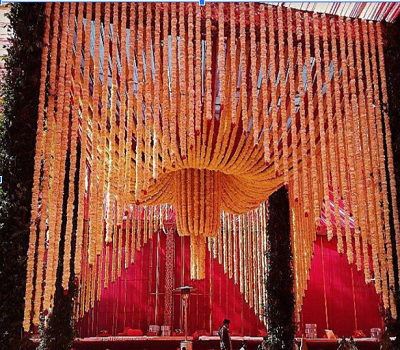 Even the mandap is adorned with myriad hues of orange, reds and yellows, even flowers and leaves beautify it. They say that the structure is created to remind everyone of how stunning mother nature can be. 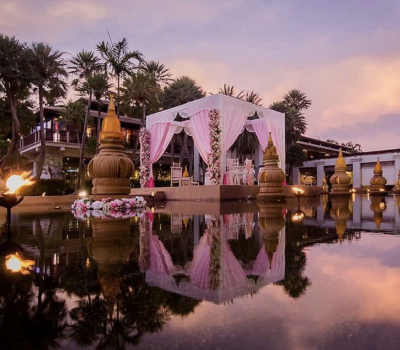 Now to make it all easier for you, we’ve selected the prettiest wedding mandaps for you to take inspiration from for your D-day. POPxo is now available in six languages: English, Hindi, Tamil, Telugu, Marathi and Bangla. AWESOME NEWS! POPxo SHOP is now Open! Get 25% off on all the super fun mugs, phone covers, cushions, laptop sleeves, and more! Use coupon code POPXOFIRST. Online shopping for women never looked better! This story was updated in March 2019.